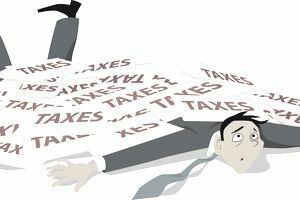 Here is a look at what happens if you can't pay your taxes, along with some alternatives for payment. In general, it is always best to pay all of your taxes on time, or as soon as possible. The sooner you pay and the more you pay, the less you will owe in interest and penalties. You will need to know the tax return date for your type of business legal form. The filing date is also the payment date. So if your business must file its tax return by March 15, you must also pay taxes due by that date. The IRS imposes both fines and penalties on taxpayers and businesses who don't pay their taxes online or who fail to pay at all. Interest on unpaid taxes is currently calculated at the rate of 6 percent per year and late payment penalties are normally 0.5 percent (1/2 of 1 percent) per month, after the deadline. If you can pay 90 percent of the taxes due, you may be able to avoid penalties, but you will still owe interest on any unpaid amounts. In addition, there is a 5-percent-per-month late-filing penalty. Of course, the sooner you pay, the lower the fines and penalties. Pay as much as possible on the due date As stated above, the more you pay and the sooner, the less you will owe in penalties and interest. Get a short-term (120 day) extension. A short-term extension gives a taxpayer up to 120 days to pay. No fee is charged, but the late-payment penalty plus interest will apply. Pay by credit card. The IRS accepts credit card and debit card payments, through certain providers. If you are filing Form 1040 or an extension on Form 4868, you can file through a list of certified processors. These providers will charge you a small fee for this service. You may also pay by credit card when you e-file through TurboTax, TaxCut, or other tax preparation software. Pay By agreement or installment. You may qualify for an installment plan payment option from the IRS. This option depends on how much you owe. The IRS has an Online Payment Agreement that you can use to pay your taxes by installment. To see if you are eligible for this type of agreement, go to the Online Payment Agreement page and spend a few minutes working your way through the online prompts. The Online Payment Agreement is on the web only during certain hours and days. As you can see, the IRS is willing to work with you to help you pay off your tax debt, but you will still be liable for fines and penalties on unpaid amounts. The sooner you contact the IRS and begin working with them to get your taxes paid, the less you will have to pay in fines and penalties. Read more from the IRS about Alternative Payment Plans and Hardship Information. Monday through Friday, from 7:00 a.m. to 10:00 p.m. local time (Alaska & Hawaii follow Pacific Time). The best times to call during April are before 10:00 a.m. and after 7:00 p.m., and Monday is the heaviest traffic day.